When the leading online travel portal Airasia.com announces the World’s Best Online Travel Fair, I realized this is the apt time to travel to my dream destination. I was in class two back then, we had this Geography chapter on Thailand and I remember how I used to boast that my father was staying in its capital city at that time. And same year I got a chance to travel to that beautiful country. Now when thinking of those days, I am only left with some wonderful pictures and a vague memory of my first international holiday. Sitting here with my old album as the rain pouring outside, I discuss at home about family tour. Thanks to the unbelievable Airasia ticket fares, it makes my job easier to get a nod from my people. Everyone is very excited and then the question pops out 'Where?' So we decide to pick one destination of our choice. No. wait.. We are not influenced by Zindagi Na Milege Dobara! Keeping our budget in mind and of course with this tempting ‘just grab’ Airasia fair opportunity, we all come up with wonderful locations around Asia including SriLanka, Malaysia, etc. while my obvious choice is Bangkok. After all, I truly want to relive my childhood memories. It is so unfair. How can one country have it all - Picture postcard scenery, amazing food, beautiful architecture, ancient culture and arguably the world’s best malls? And if that country is Thailand, it beckons you just catch the next AirAsia flight and go. My father always talks about Bangkok as a city of different shades and infinite layers which needed to be explored better to find its hidden secrets. They say some are spoken of only in whispers and others take years to discover, as secrets are always fun to explore, in Bangkok, he says, they are plentiful. Amazing Thailand Always Amazes You. He starts to list down some must-dos in Bangkok. Besides temples, shopping malls and naughty nightlife, the city has much more to offer in terms of sightseeing and attractions. And here I am already sketching my plans on how to spend my days in that beautiful city. Being a curious traveler, I make sure I shouldn't miss visiting any of these and even more. While I sit here dreaming, I can see Bangkok is inviting with widespread arms beholding some unforgettable experiences for me. The Grand Palace and Wat Prakaew - Palaces always intrigue me with its fine architecture and intricate details and Wat PraKaew, the oldest Buddhist temple, enshrines the Emerald Buddha - the sacred Buddha image meticulously carved from a single block of emerald. Wow. and for my architectural interested mind, I certainly looking forward to visit these ancient places. Wat Arun – the temple of dawn which is magnificently located in the banks of Chao Praya River is one of the most stunning Buddhist temples in Bangkok. Chao Praya River - The riverside, reflects a constantly changing scene day and night, set against a backdrop of glittering temples and luxury hotels, is one of the most scenic areas to sight see in the city. And I would love to visit this place at night time to enjoy the shimmering river. Floating Market offers an authentic experience despite its increasing tourist atmosphere. Imagine dozens of wooden row boats floating by, each laden brimming with farm fresh fruits, vegetables and flowers. Among all my old trip memories, this is the only thing that remains with me till now. And for sure it is a visual treat for our eyes. A must for any art lover, the Museum of Contemporary Art houses the most comprehensive collection of modern painting and sculpture inside a strikingly contemporary gallery. I can’t wait to refresh myself exploring some of the country’s classic arts. One of the most endearing features of Bangkok is the city's numerous parks and among them Benjakitti Park has noteworthy scenery which overlooks one of the most picturesque views of the downtown city skyline. Khlong San Saeb – Ornate Italian Rocco bridges and old wooden homes aplenty, this is the closest ‘Venice of the East’. Best place to explore some wistful charm of the old city. Crocodile farm – although I am afraid of these creatures, I certainly don’t want to miss my chance to visit this farm once and see how they perform.. perhaps that will get over my fear as well. Siam Ocean World – my wild fantasy is to try scuba dive and see those under water beauty. But if not, I would love to visit this one of the largest aquariums in South East Asia and waiting to get immersed in their beautiful colors underneath. Jim Thompson Museum – a vast collection of Thai art and antiques is on display here. This place itself is a lovely complex of Thai style teak wood houses preserved to their original glory. Chatuchak Weekend Market is huge and with its diverse collections of merchandise will bring any seasoned shoppers to their knees. And I am eagerly looking forward to shop..shop and shop till my luggage gets heavier to carry home. Asiatique – a combination of two most popular shopping experiences in the city - Night bazaar and a Mall. I am very amused by the idea of night shopping where I’m waiting to have fun browsing some 1000 boutiques under one roof, picking up gifts and stuff for me too and of course to eat to my stomach’s delight. Apart from shopping and eating out, I want to see the Thai Puppet show. Chinatown is a colorfully exotic area, packed with market stalls and it is filled with spirit of celebration almost everyday. Would I dare to miss my chance to witness this pleasing yet a chaotic place? No way! Bangkok's Spas are the best inner city gateways to the seventh heaven. Its tranquility helps to pamper the body. Spas are for sure a better place to rejuvenate my travel tired body and to captivate my senses. Tuk Tuk (Thai Auto) service that are available almost anywhere waiting to take you around along with inspiration for sightseeing and recommendations for shops and restaurants to discover in the area and to make our ride delightful. Each of these places has an intriguing story to tell. If the palaces, museums, spas and temples can be described as a lady with calm aura who lives her life at her own pace having ‘the world can wait’ attitude, the market and shopping arena wake you up with a jolt as a bubbly girl next door which brings you the instant connection with its exotic and hustle bustle environment - Carpe Diem. 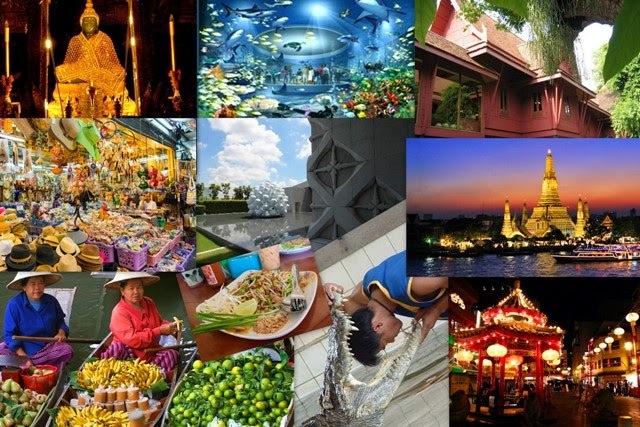 Talking about Bangkok would be incomplete without mentioning their exotic cuisine. My father mentions the taste about Pad Thai (Thai style Fried Noodles) and Gaeng Keow Wan Kai (Green Chicken Curry). Well, now that I can't wait to feast my taste buds too. Atlast... the only thing I have to do now is to book our tickets online and pack our stuff to make use of this World’s Best Online Travel Fair and fly to see the treasures that has given this city an iconic status. I think I prefer.. well, I wish to travel to my content. Once I land there, my dream comes true and I know I am going to say... 'In Paradise, I am'. Cool.. Now why don’t you check out World's Best Online Travel Fair? You may not want to miss this amazing opportunity to travel to Bangkok or Kuala Lampur... with their awesome and tempting discount fares. Happy Flying! Happy Travelling! Thank You Air Asia! WOW, there are so many places to visit there. No wonder its your favorite destination. Good Luck! [ Smiles ] It looks as though Air Asia can take you to almost any paradise on Earth. All the best for the contest. Love the way you have described thailand in the post above. Very comprehensive . Hope you win! wowwwww this is reallyyy nice :) :) All the best Meera!! Really nice, Meera! Bangkok looks tempting! hey that's a good idea. I'll surely do that.. but aft this contest ends :p thanks so much rats.